It was Napoleon Bonaparte I who first decided that he wanted a bridge over the River Seine between the Champs de Mars and the Trocadero gardens, and originally was meant to be called the Pont de l'Ecole Militaire or the Pont du Champ de Mars. However, after winning the battle of Jena on 14th October 1806, in a formal decree in 1807 that was issued in Warsaw, it was decided that the new bridge over the River Seine was to be called the Pont d'Iena, which is the French translation for Bridge of Jena. 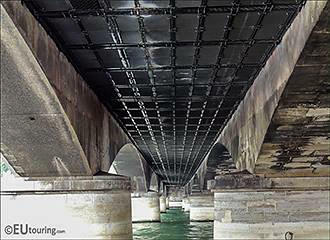 The project was entrusted to Jacques Dillonwho originally designed the Pont des Arts bridge, but after he died the construction of the bridge was passed to the engineer and architect Francois Laurent Lamande, who who had already designed the Pont d'Austerlitz bridge. And even though the original idea was for a cast iron bridge, the idea was changed to stonework, which was decided by an imperial decree in 1808 as it was felt that this would be stronger and easier to maintain in the long term. Yet, the foundations for the original designs had already been started in 1807, and therefore everything had to be changed to cater for the new construction materials. Work on the Pont d'Iena was slow going and although the concrete construction of the bridge was started in 1808, it was not actually completed until 1814, and comprising of five arches with four intermediate piers, the tympana that go down to the piers in between the arches were decorated with imperial eagles that were designed by Francois-Frederic Lemot, yet sculpted by Jean-Francois Mouret. However, with the fall of the Empire in 1815 after Napoleon was defeated, the bridge was going to be demolished, due to the name bringing back bad memories for the Prussians, yet it was saved from this fate by King Louis XVII. 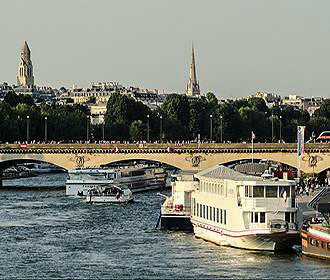 Although, the name was changed to the Pont des Invalides and the beautiful imperial eagles were removed and replaced by the royal L.
But after the French Revolution in 1830 the bridge was returned to its original name of the Pont d'Iena, and then with the return of Napoleon from where he had died in captivity, the idea came about to put back Imperial Eagles on the tympana as they were originally. Yet this was not to become a reality until 1852 when the artist Antoine-Louis Barye reproduced the eagles and these were put back as pride of place above the piers. 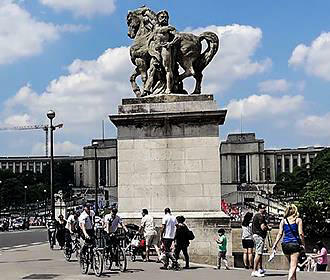 Then in 1853, four statues were put in place on the Pont d'Iena that had been sculpted by different artists and all are equestrian statues with warriors. You will find two of these large statues on the right bank, one of a Gallic Warrior that was sculpted by Antoine Preault and another of a Roman Warrior produced by Louis Daumas. Whereas on the left bank there is an equestrian statue of an Arab warrior sculpted by Jean-Jacques Feuchère and opposite on the same bank of the River Seine is a Greek warrior that was produced by Francois Devault. 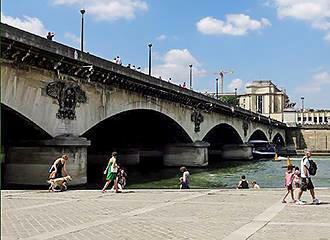 However, towards the end of the 1800s, the city of Paris was finding that the bridge, being only around 14 metres in width, was becoming far too narrow to accomodate the traffic and people, so it was decided that the Pont d'Iena bridge should be widened, especially with the Universal Exhibitions that were taking place, like the 1889 one, which is when the Eiffel Tower was first inaugurated at this very location. Yet with even more World Fairs, as they are also known, that were taking place in Paris, and with the expansion of the Trocadero, the proposals put forward were to widen the bridge to 40 metres in width. And by the time the Palais de Chaillot was being constructed along with the redesign of the Trocadero Gardens for the 1937 Universal Exhibition, the need for the Pont d'Iena to be widened was even more imperative. And by the 1930s, even the bridge itself was showing major signs of wear and due to the fact that repairs needed to be sorted, a plan was put in place for the widening of the Pont d'Iena in readiness for the 1937 World Fair, however, it was decided to only widen it to a width of 35 metres in total. The bridge had metal gurders put in place to join the two concrete sections, and when dressed with stone, the eagles were put back pride of place and the four equestrian statues were also repositioned, and this is how the Pont d'Iena remains to this day 2014, which has also been listed on the registry for historical monuments in Paris.